It’s a story of people and their secrets that tear them apart. The movie follows a surprising decision that each family member will make in the aftermath of a tragedy. life changing decisions that will either lead them to a future lasting happiness, or one full of despair. 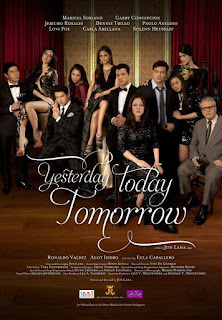 Yesterday, Today, Tomorrow is a Filipino drama film directed by Jun Luna. The film stars Maricel Soriano, Gabby Concepcion, Jericho Rosales, Dennis Trillo, Paulo Avelino, Lovi Poe, Carla Abellana, Solenn Heussaff, Ronaldo Valdez, Agot Isidro and Eula Caballero. It is an official entry for the 2011 Metro Manila Film Festival. It was released on 25 December 2011.